Evergreen’s team of industry professionals includes fire marshals, senior engineering technicians, and EL06 journeyman with NICET certification. The National Institute for Certification of Engineering Technologies (NICET) is a national agency that establishes standards and provides certification testing in civil, electrical, and mechanical technology. 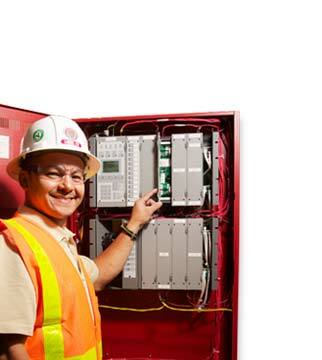 Within the fire protection category of NICET, certification for fire alarm system activities includes: system design and layout; system equipment selection; system acceptance testing; system troubleshooting, and system servicing. Technical areas covered to include codes and standards, types of detection devices, and physical science fundamentals. Evergreen takes pride in our NICET level II and III certified personnel and an industry rarity of two NICET level IV senior technicians. This unique combination of proven industry professionals allows us to provide you a seamless, certified and hassle free installation to ensure your building's occupants is safe. Our team has many years of experience on both sides of the fence, as the governmental authority having jurisdiction (AHJ) for use and designing systems for approval and life safety protection. Evergreen U/L Underwriters Laboratories certified installation company provides Fire Alarm Systems, Voice Evacuation Systems, Sprinkler Monitoring Systems, Mass Notification Systems, and complete Life Safety Design/Build Projects for both Commercial and Federal Agency Customers. We provide a comprehensive range of services from annual confidence testing, system maintenance contracts, monitoring contracts, service calls to repair existing systems, expansion of existing systems, and in depth design/build installations to meet your project's needs. Our UL, NICET, factory certified design team will work with your construction contractor, from the start to finish, to see that your Life Safety Systems meets your needs and passes certification with the municipal Fire Department or AHJ. Our design team is also available for consultations/evaluation of your existing system to see if it complies with Federal, regional and National Fire Alarm/Life Safety Codes. The largest product lines that we supply and install are EST/GE Life Safety products and Silent Knight Fire Alarm equipment. We have the ability to repair and expand a large number of manufacturer systems that are no longer maintained by the original installation company, and we have experience in a wide arena of structures/industries- apartment buildings, hotels, malls, storage facilities, aircraft hangars, Office/retail buildings, federal buildings, and churches to name a few. Additionally, our technicians are properly licensed in the State, NICET Certified, Factory certified for that product, and accepted by the local AHJ.